CombatCritic's "TravelValue": Lawrence, KS: Pizza Shuttle Stands For ZERO INTEGRITY And Earns A Spot On My "WALL OF SHAME"
Lawrence, KS: Pizza Shuttle Stands For ZERO INTEGRITY And Earns A Spot On My "WALL OF SHAME"
I will not waste my time reviewing a business that totally lacks integrity, so I will ignore the food, delivery, etc. at Pizza Shuttle and focus only on the matter at hand ... fraudulent business practices. I ordered two 14" one-topping pizzas online from Pizza Shuttle (through Eat Street - where I was automatically directed) at a price of $15.18 (including $1.38 for extra cheese on my pizza). My wife is allergic to tomatoes, so I asked for olive oil on her pizza instead of tomato sauce, a request that every pizza place we have ever ordered from has gladly and "free"ly complied with. 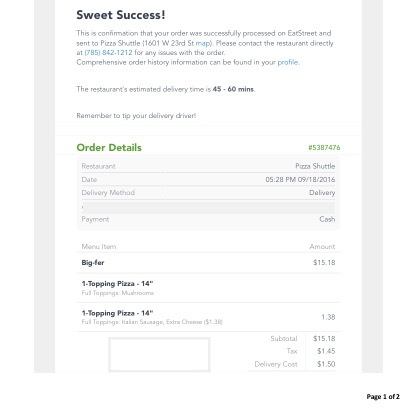 With tax at $1.45 and delivery at $1.50, the total came to $18.13 as you can see on my receipt and order confirmations (online and email) below. 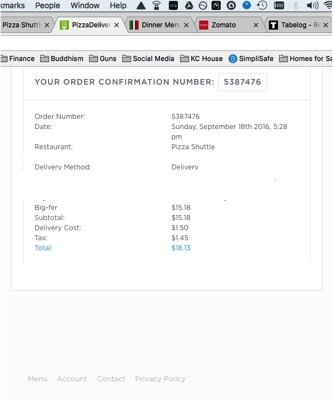 As you can clearly see, the online and email confirmations listed a total of $18.13 including tax and delivery, but when the Pizza Shuttle driver arrived he stated the total was $22.25, an additional $4.07 "due to my wife being allergic to tomatoes and substituting olive oil for tomato sauce". Nobody bothered calling to inform us of the ridiculous $4+ upcharge and when the driver called the manager to confirm the discrepancy, the manager merely stated "that's the way it is, it's Eat Street's problem, not ours". I paid the driver the extra $4.07 (because it was not his fault and he does not get paid enough to argue with irate customers) and tipped him an additional $1.75, stating "your tip would have been much larger if your manager wasn't such an a**hole. Tell him to read my review on combatcritic.com and on Yelp ... it won't be pretty!" Never again, Pizza Shuttle or Eat Street, once and I am done. CombatCritic Gives Pizza Shuttle And Eat Street 1 Bomb Out Of 10 And A Spot On My WALL OF SHAME FOR ZERO INTEGRITY ... Nuff Said! Title: Lawrence, KS: Pizza Shuttle Stands For ZERO INTEGRITY And Earns A Spot On My "WALL OF SHAME"
Translation for Civilians: FUBAR = "Fucked Up Beyond All Repair"
Apple Or Google Photos? That Is The Question!